Giant fruit signaling the entrance to a tropical paradise. Australia is home to more than just a couple of big things. 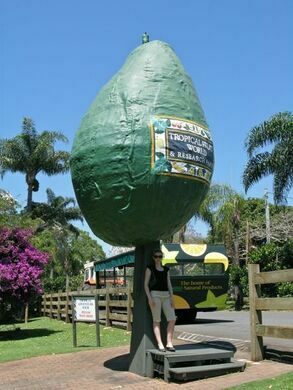 The Big Avocado is only one of a loosely related set of about 150 sculptures and large structures sprinkled across the country. Most of these, the Big Avocado included, serve as the country’s top tourist traps and can be found along major roads and highways or between some of the major travel destinations. The avocado doesn’t have the same size as some of the country’s other giant sculptures, but it is worth a visit, if tourism sites are to be believed. They recommend visiting Duranbah’s Tropical Fruit World (formerly known as Avocado Adventureland, hence the construction of the massive statue in the first place). Duranbah’s is popular because of its avocado orchards, which can be toured by visitors, and its avocado ice cream and milkshakes. The park is south from the Gold Coast Airport. For 10 minutes, drive on the Pacific Highway, then turn to the Murwillumbah Exit 40. From there, just follow the sign towards the entrance of the park. The largest wax museum in the southern hemisphere features a grizzly chamber of horrors. The Australian terminal of the Pacific Cable that linked the continent to North America. There's nothing shrimpy about the world's largest artificial prawn. Begun over 80 years ago, this science experiment keeps on going, ever so slowly. A statue erected in honor of the toadish nickname given to Jersey residents by the French. A statue in the Texas town that proudly calls itself the killer bee capital of the world. A hidden garden of stones engraved with scriptures, a Joseph Smith Sphinx, all carved by one man. This massive blockhead sculpture hides an entire library.